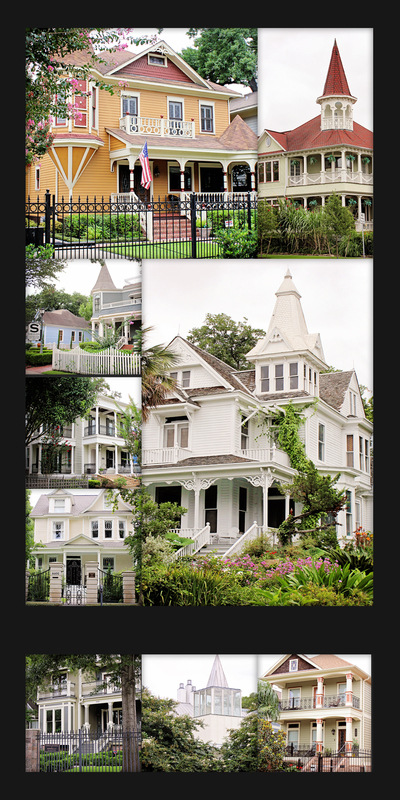 You are viewing just a glimpse of the HISTORIC HOUSTON HEIGHTS district. Tarzan and I decided to take a tour of this eclectic neighborhood that we have heard SOO much about. It did NOT disappoint my friends. Our mouths were open the whole time, I can’t even count how many times I said, “Honey, I would LOVE to live here…smile. One thing I was disappointed with myself…I didn’t capture any of the craftsman bungalows…sigh. I think the Victorian homes with their grand scale kept my attention a little too much. Houston Heights roughly encompasses the area between Studewood and N Durham. On the south it is bordered by I-10, and to the north it goes to the 610 N Loop. 1891 Oscar Martin Cooley and investors formed the Omaha and South Texas Land Company. It purchased 1756 acres of land that would become Houston Heights. It was one of the first “suburbs” of Houston; a streetcar community of the “dense” urban center. It was called Heights because it was around 30 feet higher than the swampy, mosquito laden area around Allen’s Landing. The first home built by the Omaha and South Texas Land Company, in 1893, was the Cooley home (pictured top right hand corner of photo collage) at 1802 Boulevard. Today, it is still standing and occupied by Circa Real Estate Company. The Heights declined after WWII and continued its slide until the 1970′s. It was still considered a low income area when remodeling of these cool old homes started. The homes were cheap, and the land could hardly be given away until the 1980′s when renovation began in earnest. Houston Heights is not uniform. Because it was once incorporated, it had its own shopping areas (i.e. the funky/cool shops along 19th St), its own industrial areas (an old steel plant was just demolished last year), lots of warehouses, etc. Everything you would expect from a small, early 1900′s town. These “good, bad and ugly” parts can still be seen, but not nearly as noticeable as a few years ago. The Heights is one of the hottest neighborhoods around, and the industrial relics are fast disappearing. Walking through the Heights now is still like walking back in time. Lots of 1890′s Victorians and the newer (1910-1930′s) Craftsman bungalows. All of these old homes had the popular cupola of the period and the gabled roof to top off the elegant decoration. The Mills home was possibly the most pretentious, highly decorative with its intricate “gingerbread” fretwork. One pictures lace curtains, the tea cozy, and the tray for calling cards as setting the tone for early Boulevard society. The Heights today is booming. It is one of the hottest areas for real estate in the city. New construction is everywhere. Renovations are again strong after having died out for a while. The renovations are not for the timid or cash-strapped though. It takes a lot of money to play this game now, and you had better know what you are doing and have good subcontractors from what I hear. The Heights is a premier neighborhood now! It is no longer just for people seeking a charming, eclectic area. As we strolled along, we found some other delights that I will be sharing in future posts. Want a little more visual delight? Check out Kathrine Hepburn’s Estate click here. Did you enjoy the Historic Heights Collage? Lovely shots – I would never have identified the houses with Houston. Looking forward to seeing the craftsmen bungalows when you next swish by! Wow. Those houses are stunning. My girls enjoy exploring old houses. There is something magical about them. Oh my goodness, these houses are gorgeous, Laurie. I wonder what the interiors looks like. I’ll bet equally as gorgeous as the outsides. Hi, Thanks for coming by and visiting my decorated gate. I loved that place I sure do miss it. I am glad I have that pic. LOVE old houses like these — and you’ve captured them so well, Laurie! Are you going to go back for the Craftsman homes? They are my all-time favorite house architectue. Wonderful post and images Laurie. I’d love to visit one day. We love to tour towns with interesting architecture, particularly the homes. Thanks for the tour and the background of the area Laurie. You are finding such great places to see in Houston. I’m going to have to add Houston as a place to visit. I’m so glad that these old homes are being re-done. Simply gorgeous! They remind me of the homes on Cape May, NJ. Wonderful post; enjoyed the history! Super pictures Laurie .. you really do find some places for us to enjoy ! Lovely shots of these beautiful buildings! Those look like ginormous doll houses! These are some lovely old houses and I would be remiss if I didn’t tell you that we also have some on Main Street Middletown. I might try to take a few pictures to send you, however, they won’t be as nice as yours. Nice! It’s lovely to see how much love and care has been given to these historic houses. Beautiful neighborhood. Nice homes and the surrounding. Well put together in collage! One of the better places to take photos in Houston. Great job capturing one of my favorite areas. You will have fun with your camera in Houston! Love your shots. What a great collection. I remember yours from last week. Thanks for coming by my post too. These homes are stunning. I just love wandering around neighborhoods looking at beautiful architecture! I would love to join you and stay in that neighbourhood Laurie. It is so beautiful. I’d take any one of them! I love old, charming homes like these. We have a similar little town near us and I drool over the homes. It is great. It looks big and regal. Terrific shots! I’d like to live there too. I absolutely adore these old vintage style homes! We have a few of them here in our small town and they just have so much character! Great captures! This is my kind of photo walk! Love it. Thanks for sharing. Love old houses and these are beautiful. Enjoyed the pictures and the story behind them. I always enjoy seeing how the 1% lives. 🙂 Beautiful architecture and gardens.